Layers: The Layers panel displays all the layers you’ve added to a photo. Look at how the different panels are designed. In the Layers panel, you find various tools at the top-left corner and an icon with horizontal lines in the top-right corner. New in Elements 15 are layer groups. You can select multiple layers and click the folder icon at the top of the Layers panel to create a new layer group. 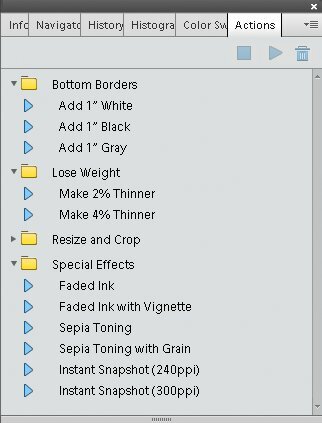 All the grouped layers are nested in a folder. When you click the icon at the top right, a pop-up menu appears. Here, you see menu items supporting the tasks you perform in the Layers panel. The Layers panel pop-up menu. Effects: At the bottom of the Panel Bin, click the fx button to open the Effects panel. The Effects panel contains menus and tabs for applying a number of different effects to your pictures. You simply double-click the effect you want when you edit the photo. Graphics: The Graphics panel contains several menus where you can choose among a huge assortment of graphic illustrations that can also be applied to your photos. Favorites: The Favorites panel also contains a number of graphic images. You can also select items from the Effects and the Graphics panel and then add them to the Favorites panel. More: Click the down-pointing arrow at the bottom of the Panel Bin to the right of the More button, and a pop-up menu opens, allowing you to choose additional panels. The Layers, Effects, Filters, Styles, Graphics, and Favorites panels are docked in the Panel Bin and can’t be removed. Now in Elements 15 you find the Filters and Styles panels. Click the down-pointing arrow to display a menu where you can open additional panels. Actions: Actions enable you to automate a series of edits to your pictures. You can see the Actions that are supported when you open the Text Effects presets. As with other panels, a pop-up menu is supported, and it offers Load, Replace, Reset, and Clear options so you can modify Actions. Actions shown for Text Effects. Elements 15 still doesn’t support recording your own series of editing steps and capturing the steps as an Action. However, most of the Actions that are created in Adobe Photoshop can be loaded in Elements. You can find a number of free downloadable Actions on the Internet. Just search for Photoshop Actions and explore the many downloads available to you. Adjustments: The Adjustments panel works only when you have an Adjustment layer. Color Swatches: This panel displays color swatches you might use for coloring and painting. History: Choose this item to display the History panel. Info: The Info panel provides readouts for different color values and physical dimensions of your photos. Navigator: The Navigator panel helps you zoom in and move around on a photo in the image window. Custom Workspace: When you choose Custom Workspace, you can dock and undock panels. 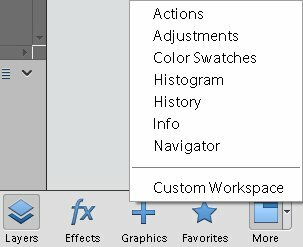 This option enables you to configure a custom workspace to your liking. Create/Share panel: These panels also exist in the Organizer. Click Create at the top right of the Panel Bin to open the Create panel in the Photo Editor. In both the Photo Editor and the Organizer, the Create panel is used for making a number of creations such as calendars, photo books, greeting cards, photo collages, and more. The Share panel contains many options for sharing your photos. When you open the additional panels as floating windows, the panels are docked in a common floating window. You can drag a panel out of the docked position and view it as a separate panel or move it to the docked panels. When you open a panel in either the Organizer or the Photo Editor, you find other options available from tools, drop-down lists, and a menu you open by clicking the icon with horizontal lines in the top-right corner of the panel.